I can't say that I am a prolific blogger. Anyone who spends more than 30 seconds on this site can probably tell that I am hard pushed to scrounge up more than one or two posts a year at the moment. This is probably a reflection of how busy my life has become, juggling all the different hats that I wear. Blogging, enjoyable as it is, just is not a priority in my life. My second ever dodgy blog award! 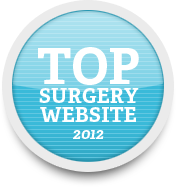 Nevertheless, I strive for quality over quantity, and as a result, I am quite frankly amazed that the single post that I managed to produce in 2012 has won me an award for "Top Surgery Website in 2012". Never mind the fact that it was just a video that I found funny with a tangential relevance to surgery. My kids still can't understand why it is dumb to sell both your kidneys on the Internet. Or for that matter what kidneys are, why anyone would want to buy them, and why you need them in the first place. I guess I'm not as good a clinical teacher as I though I was. Having only ever won one Blog Award in the past from a dodgy self-promoting website, I am as chuffed as ever to have won a second dodgy blog award for doing, basically, nothing. Perhaps this will inspire me to continue to blog as little as possible in 2013... though I think I might have a few things to vent over in coming weeks. For now, please feel free to bow down and bask in the warm glow of my awesomeness! We hope our readers, mostly aspiring surgical technicians, will find this collection of excellent sites about all types of surgery useful and inspiring as they consider their educational opportunities for moving forward in this rewarding health care career. We've made a badge that you can post on your site if you'd like to share this award with your visitors and readers. You can either use the HTML code below or the attached graphic file. Congratulations, and please feel free to email me with any questions or other feedback. OK, this is just so catchy and well-produced that I have to share it. A lesson in how to do community service announcements successfully. Karaoke version here. Wikipedia info here.